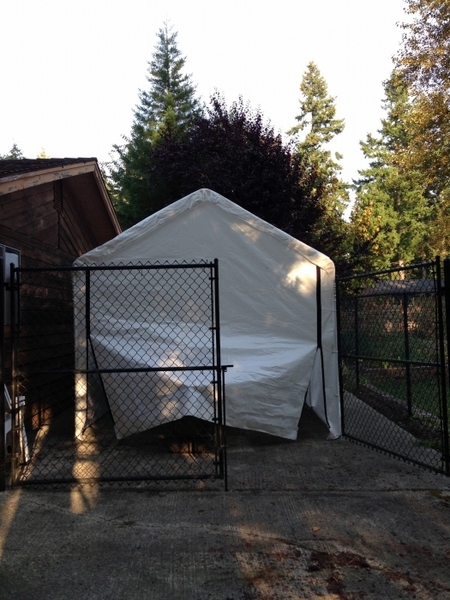 A Shelter Logic canopy is a super option for a quick and easy, yet durable and sturdy shelter for protecting whatever you need to keep under wraps. The tough, beam-welded steel frame is subjected to a thirteen step Rhino Shield surface preparation process and has a DuPont baked-on finish which eliminates chipping, peeling, rust and weathering. The one-piece valance cover is completely tear resistant, made from 100% weatherproof polyethylene which has been UV treated to prevent aging and fading. The 10x20 foot canopy can be quickly converted into a fully enclosed shelter with two side panels, a rear fitted panel and a double-zippered front door panel. 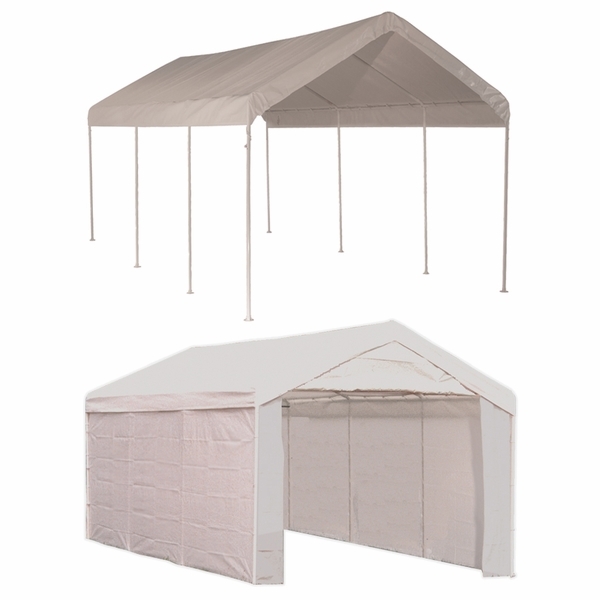 Wide base foot pads and temporary anchors ensure that your Shelter Logic canopy will stay put. Is canopy #23529 available without the side kit? I like the canopy but only need the top roof. This product is available without the enclosure kit. 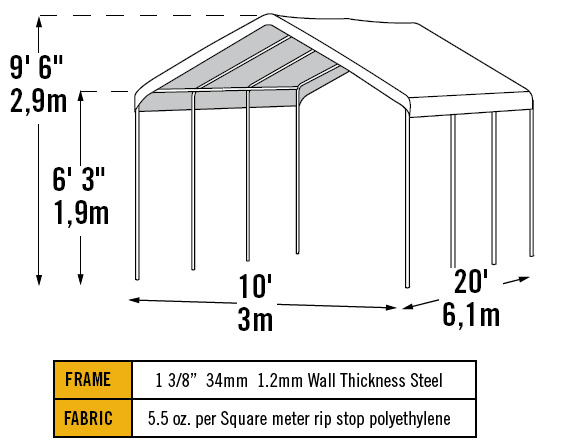 The item is the ShelterLogic 10 x 20 Max AP 8 Leg Canopy Shelter - 23522. How well this product hold up in 110 degree temperatures? It is UV treated inside and out with added fade blockers, anti-aging, anti-fungal agents, so it should hold up fine. Does this canopy come in green? Unfortunately, no, this canopy and enclosure kit are only available together in white. We apologize for the inconvenience. Can I use this canopy as a greenhouse? Does it have a zippered rear door and windows or ventilation for the front and back? 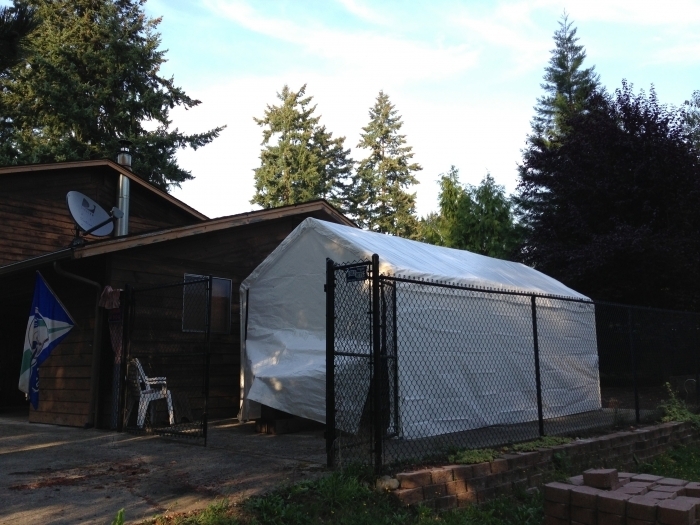 This shelter will not function as a greenhouse, nor does it have a rear door. Can this be extended or raised to accommodate a Class A motor home? No, we are not able to order extensions to raise this shelter. Can this item be had in Dark Green? Unfortunately, this is only available in white. However, you may consider the Shelter Logic 10 x 20 Green Decorative Garden Canopy Shelter. My "Stang" and I THANK YOU!! I purchased this product back in April 2010 and I love it. My sister and I easily set it up and with minimal maintenance it withstood five, very weather-active Maine years!! Hence, am now buying my second one!! I was able to put this up by myself in less than four hours. Very impressed with its sturdiness. I will buy another one for my truck. ProsEasy to put together and sturdy. Went right together with no problems. Did just what i expected. Thank you. I was very disappointed with my canopy. First, the poles are 1 3/8" diameter, not 2' like I expected. Second, the poles are all 2 pieces. There is no structure to it at all. Cheap and flimsy is the best description. 7 of the 8 plastic feet broke during the first minor wind storm it saw. Feel Very Positive about this product! Overall I am very positive about purchase. I really like the door. The gives me plenty of room for my car and storage of some items like kayak and bike. The canopy has already withstood 30 mph wind gusts. The real test will come this summer and how it holds up in our Arizona heat and monsoon rains. I expect it will do well. ProsThoughtful design, solid construction and quality materials. Good value for price. ConsSet-up instructions need to be even more detailed and/or certain aspects of assembly emphasized. I strongly recommend you STRESS the importance of putting on the roof canopy before trying to locate or anchor the unit. it collapsed on me once and I luckily avoided being hit by the falling pipe. Add a method for easily raising and lowering the door. The frame went together with ease, about 30 min. I put the cover on before i attached the legs. I thought this was easier however I had one other person helping. The wall height was about 11" shorter than what i needed to clear my wake board tower. ShelterLogic made it easy by making the poles standard 1 5/8" like the fence post at Home Depot I was able to use a coupling and 8 pieces of 11" pipe. Now i can pull my boat in and out of the canopy without dropping my tower. Shipping was very fast - just in time for a major storm's arrival. A friend and I set this whole thing up in two hours, with the decent directions enclosed. The stretch-cord ties work but lack an easy tensioning; by twisting the cords several turns after they are threaded in place, the tension can be adjusted. The enclosure had an immediate test, with heavy rain and 40 mph winds hitting even before I could even adequately nail the bases to the asphalt. Some of the swagged tubes fit a tad loosely, but using good old black electrical tape, I temporarily secured several of the tubes together. Even when wet, that tape held well. At the peak of the storm, which dumped about 5 or 6 inches of water overnight, a huge gust slammed into the barely secured garage, lifting it intact and flipping it on its head! only one corner piece is slightly flared out, and it still fits together with the leg. At that same corner, one eye-rivet ripped out, and several of the cord-ties had popped free at various areas. I am in the process of inserting self-drilling screws on the fittings, and I plan to sink expansion bolts at the bases, along with 1/4 inch bolts to attach the legs. Space constraints preclude using tie-down lines all around, but I hope to run some guy-wires from the top part of the frame to the expansion bolts. I shopped all over the web and found this store to have overall the best information and value for what I was looking for. The shipping process was smooth and I was well informed. Definitely a 2 person job to put it together but it was easy and all the parts were there. For this price, can't beat it. Thanks! This product went together very nicely. Product arrived free of damage. Would purchase again if I need to!! 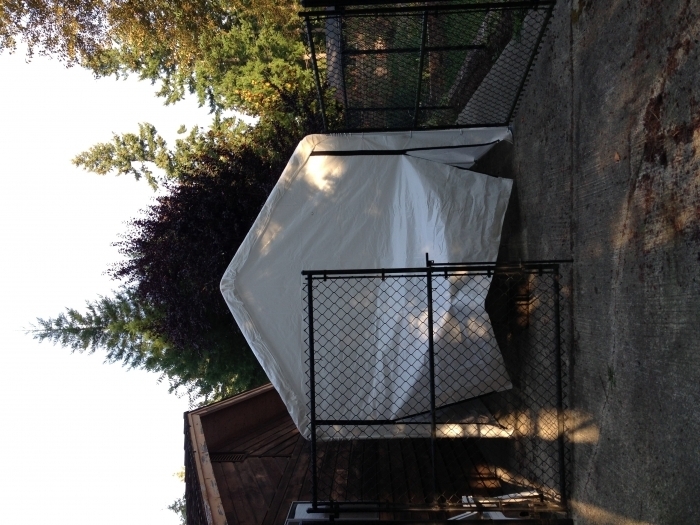 I needed a carport for my "weekend" car and didn't to put a whole lot of money in it. So far, (I've had it 2 months) it's been fine. Keeps rain and leaves off well. I haven't put the sides on yet. I will in the fall. I live in Tennessee so I have a lot of leaves, but not much snow. It's not easy to put up by yourself but it's not impossible. For the $, I didn't expect as much, or the good quality I received. It went together well & is holding up well with the winds in this area. When putting the canopy together we followed the instructions to the letter. I advise that you put the roof canopy over the frame before you add the legs. I guess you get what you pay for. I am disapointed in the way the corners are joined. It is very hard to get a good fit. When the wind blows the corners blows open. The corners need to overlap to provide a better seal. The entire cover seems to be about 3 to 4 inches short of the ground. I also would like to have had screws at the joints to keep them together. The instructions are poor. This canopy is has trouble holding up it's own weight. Pipes are less than adequate for the price. I would not purchase this canopy again. We bought this mostly to put over our outside gas firepit. We rarely use it in the winter because it's too cold. It is amazing how quickly and nicely the fire pit heats up this canopy/enclosure. Our patio covers it so we don't have to worry about snow piling on it as it is not built to hold snow weight. We have had several outdoor cookouts already and there is plenty of room for the whole family. (We leave a little of the zipper open to make sure no gas fumes build up.) I'm sure there will be many uses for it during the summer months also. Shipping great, easy erect, sturdy. ProsGreat price! Wish bases were Metal. The canopy was not as easy to assemble as stated on the directions. It was as I expected.